1. In a dry frying pan over medium heat, toast the almonds on the stove – watching closely that they brown but don’t burn. Set them aside to cool off. 2. In a large salad bowl, toss the mesclun or spring salad mix, the gorgonzola or blue cheese crumbles, the sliced grape tomatoes, the blueberries or raspberries and the cooled toasted almonds. 3. In a resealable jar, combine the oil, vinegar and Dijon mustard. Close the lid tightly and shake vigorously. Although the usual ratio for vinaigrette is 3 parts oil to 1 part vinegar, a higher ratio of vinegar to oil is recommended for this dressing. Taste test as you add the vinegar to see if you agree! I prefer 3 tbsp. of vinegar to 4 tbsp. of oil. 4. 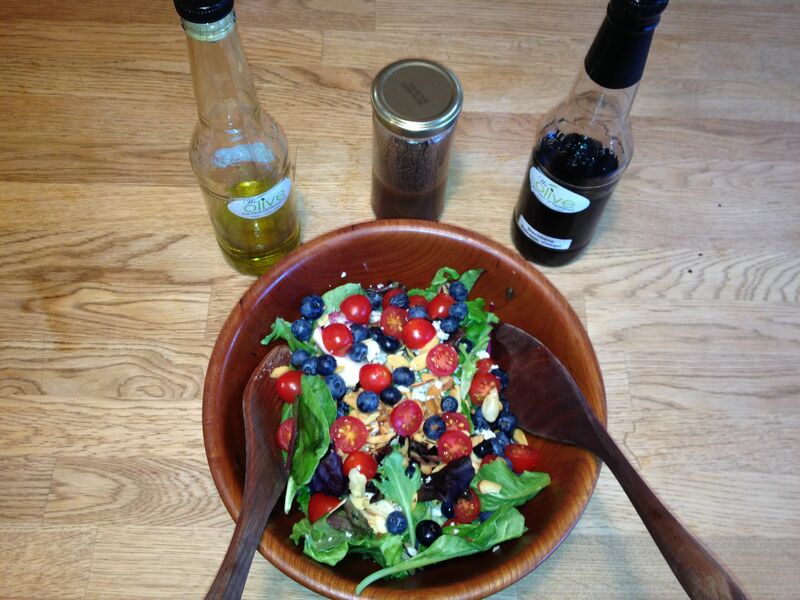 When you are ready to eat salad, before, during or after your meal, dress the salad with the vinaigrette. The almonds combined with the cheese takes this stand alone salad to another level. Served with a favorite seafood or chicken, the salad is great. Or, for those warm summer evenings, this creative mix has the substance to stand by itself. Truly a treat. Highly recommended. Karen’s salad is delicious. Don’t jestitate to prepart it and enjoy….. Sounds like a delicious and versatile salad. I will definitely make it. I will definitely make this salad. I have had Karen’s salad and it is delicious.